We organize and lead Day Trips for Groups and Individuals to Whitetail, PA, Seven Springs, PA, Hidden Valley, PA, Ski Roundtop, PA, Ski Liberty, PA, Massanutten, VA, Timberline, WV and other areas. Massanutten and Timberline Trips are from the Washington, DC Metro Area. All other Day Trips listed are from the Washington, DC or Baltimore Metro areas. Please contact us for trips from other areas. Day Trips include our helpful & experienced professional adult staff (1:10 staff to student ratio), all day lift ticket and round-trip transportation via DVD / video equipped luxury motor coach and any needed and unlimited instruction by our PSIA (Professional Ski Instructors of America) certified staff. Trips to some ski areas such as Whitetail offer options that include ski or snowboard rental equipment, helmet rentals and a ski or snowboard lesson for any level. If you do not have your own ski or snowboard equipment, we suggest that you rent it at the ski area. For your safety, we highly recommend wearing a helmet while skiing or snowboarding. Lessons are required for anyone skiing or snowboarding for the first time. Other levels may take a lesson if they wish, but it is not required. The TASC staff assist students with getting the proper rental equipment and making sure they have the correct fit. The staff also make sure students get into the correct level ski or snowboard school lesson and assist them if they need additional instruction after their lesson. Below are details for sample Day Trips to Whitetail, PA and Seven Springs, PA. We offer trips to several other ski areas. Contact us for details to those areas. WHITETAIL, PA – One Day Ski & Snowboard Trip. 20 trails, 935 ft. vertical, 9 lifts including 4 quad chairlifts one of which is a high speed detachable quad. Trip includes helpful and experienced professional adult staff (1:10 staff to student ratio), all day lift ticket (all day & night skiing), round-trip transportation via DVD / video equipped luxury motor coach (or video equipped van if it is a small trip), any needed and unlimited instruction by our PSIA (Professional Ski Instructors of America) certified staff. Our staff are on the trip to help each student have the best trip possible. We help the students get the proper rental equipment, make sure they are in the proper ski or snowboard school lesson and help in any way possible. 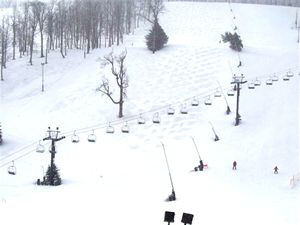 SEVEN SPRINGS, PA – One Day Ski & Snowboard Trip. 33 slopes & trails for beginners to experts, 10 lifts including 2 high-speed 6 passenger chairlifts. Huge resort complex has snowtubing, bowling, indoor mini golf, gigantic arcade, shopping and more. Trip includes helpful and experienced professional adult staff (1:10 staff to student ratio), all day lift ticket (ski or snowboard from 9am-7pm), round-trip transportation via DVD / video equipped luxury motor coach (or video equipped van if it is a small trip), any needed and unlimited instruction by our PSIA (Professional Ski Instructors of America) certified staff. Our staff are on the trip to help each student have the best trip possible. We help the students get the proper rental equipment, make sure they are in the proper ski or snowboard school lesson and help in any way possible. Rates May Be Higher for Christmas, MLK & GWB Holiday Periods. Contact us for Details. Save $$$ when paying in 1 month in advance! * Rates quoted above are when paid at least 1 month in advance of trip. Additional $15 when when paid less than 1 month before trip.